Most eBay users spend their time hunting for specific items — say, Barbie dolls, designer dresses, baseball cards, plumbing supplies, or U.S. stamps. 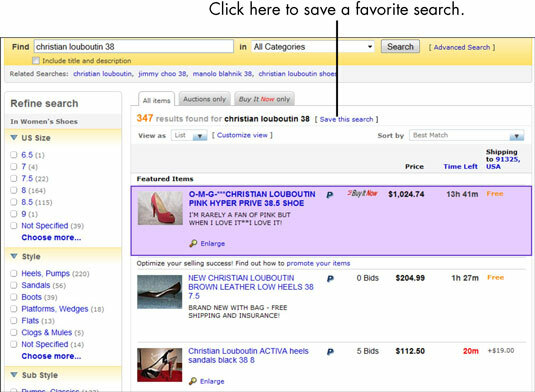 That’s why eBay came up with the Organize area of your My eBay page where you can organize all your eBay searches. Whenever you view your My eBay Organize links, you see a list of your favorite searches and sellers. But because eBay isn’t psychic, you have to tell it what you want listed there. If you’re like most people, you’ll look for similar things and sellers over and over. 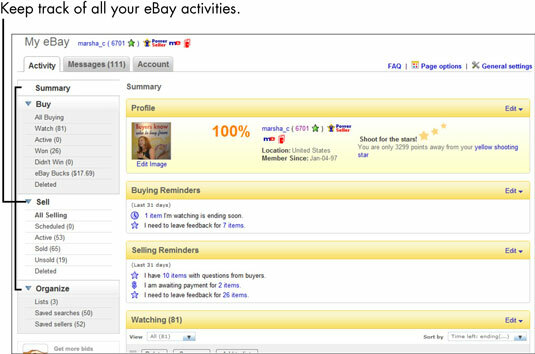 The My eBay Organize area is a place to gather and make note of your favorite searches and sellers. You can perform these searches and visit these stores with a click of your mouse. You can save up to 100 favorite searches in the Saved Searches area. To add a search to your favorites, first perform the search. When the search appears on your screen, click the Save This Search link, shown at the top of the search results. Your search is then transported to your My eBay Favorite Searches area, where it’s identified by the name you provide in the Name This Search box. In this example, the name of the search is the same as the search terms used. If you want to be notified by e-mail when new items are listed, select the check box and the time frame in the drop-down menu. When you want to repeat one of these saved searches, just click the Search name to search for the item. 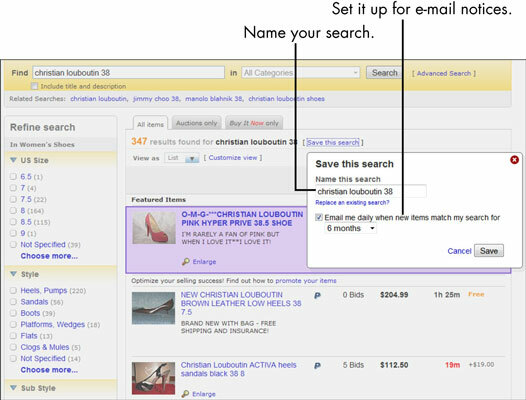 eBay will even e-mail you up to 20 of your searches when new items are listed. Similarly, when you find a seller whose merchandise and prices are right up your alley and you know you’d like to check out that seller’s auctions occasionally, you can list the seller in the Favorite Sellers area. From one of the seller’s item listings, click the link to view the seller’s other items. You see a search page listing all the items for sale by that seller. Scroll down the list of all items, and on the left side, click the Add to Saved Sellers link. The seller is saved to your My eBay Saved Sellers (favorites) page. If you find sellers whom you’d like to add as favorites while you’re browsing or buying in their eBay stores, click the Add to Saved Sellers link at the top of the store’s home page.